Make sure you are connected to the FACULTY network. Students should connect to the iFCS network. You can check this from the “Settings” app on your iPad. Turn your WiFi off and back on. You can also do this from the “Settings” app or by swiping up from the bottom of your iPad and pressing the WiFi button. 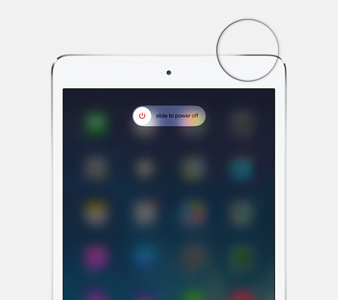 Turn your iPad off and back on by holding down the button on the top right corner of your iPad. After a few seconds a slider will appear toward the top of the screen – slide to the right. Wait a few seconds and press the top corner button again to turn your iPad back on. To fix many other iPad issues not related to network connections you should first try restarting your iPad using the directions in #3 above. To fix many projection issues (such as color tints) try switching inputs back and forth between your desired input and other inputs on your projector. (City Ave ONLY) To fix additional issues with Apple TV (not solved by steps 1-3 above) reset your Apple TV using an Apple TV remote control. Press “Menu” and “Down” at the same time and hold for six seconds. Shallcross – AirPlay in Shallcross classrooms are through the AirServer app installed on computers. Restart the computer connected to your projector instead.